Moving a Mountain (detail), 2008, mixed media. Installation view. 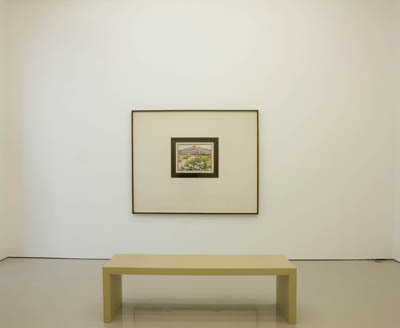 At first glance, the three works in this show (a painting, a picture of a painting, and a sheet of text) might invoke Joseph Kosuth’s tautological investigation in One and Three Chairs, 1965. But a closer look reveals a muted introspection and restrained melancholy that couldn’t be further from Kosuth’s Conceptual landmark. Moving a Mountain, 2008, documents Tan’s visit to Mexico City last November and broadens the wanderlust increasingly central to her practice. “It was the Day of the Dead, and the city was decorated with orange clusters of candles and marigolds,” begins the text, which looks like a delicately incised page from a book yet reads like a diary entry or a letter. The narrative cautiously describes Tan’s walk down the Alameda to a closed restaurant, her Colonial-style hotel, the sounds of two lovers in the room above, and then, in more detail, a painting above the bed of a snow-capped mountain. Months later, Tan returned to Mexico to replace that mountain image with another: a painting of a desert scene reminiscent of West Texas, where she was raised. Tan took a large-format photograph of that work, which faces off in the small gallery with the original Mexican painting like an imperfect reflection. Although the paintings are not too remarkable (the late Bob Ross comes to mind), the metaphoric anchors of reciprocity and exchange that link them are intriguing. More involving, though, is the sense of privacy and isolation that suffuses the understated installation. With consummate frugality, Tan examines the social life of objects and the mechanics of desire, without neglecting the equally powerful longing to get lost, to be alone.